When it comes to celebrating in style, Colin Cowie is your go-to guy. If you sit down and take stock of what you'd like as far as your wedding goes, you'll be shocked. 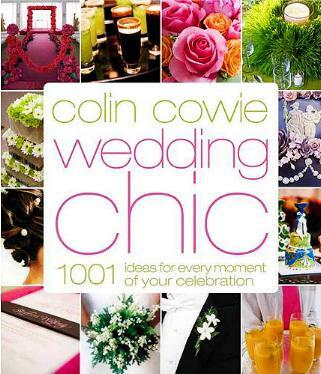 Event planner extraordinaire Colin Cowie shares his expertise at planning weddings in this helpful and informative book. He discusses everything from the choice of dress, which first song you'll play, the menu and drinks, the venue, the table setting, the flowers, your bouquet (and the myriad of color and shape options), your attendants, your rings, the guest list, the reception, the climate and season, the honeymoon, the party favors, the cake and food, and much more. It's alarming the amount of details that need attention, and by using this book you'll eliminate a lot of the unnecessary stress associated with planning a wedding. If you thought you'd be able to get away with a simple little gathering of friends and family, you might change your mind after paging through this book. Colin's weddings are detailed-oriented, so much so that you may be overwhelmed by his suggestions. He wants you to pick bits and pieces here and there and then to make them your own, per your budget, and to have fun. You won't run out of inspiration using his book but you may have a hard time coming to any conclusive decision. Whether it's an ultra-casual wedding you desire, or a spectacularly opulent wedding, you'll find something suitable in this book to make your own. The book is exquisitely illustrated with vibrant and exciting photographs, all to inspire you even more than you already are. Visit Colin Cowie Lifestyle website for much more. Conclusion - A gorgeous collection of workable wedding ideas.